Travel to China with Lucky Dragons Slot at Moon Games! Brought to you by Pragmatic Play, it comes with 5 reels and 50 paylines. Feast your eyes with the bright colours of this online slot! It is set against a backdrop showing intricate designs. The reels are enclosed within a well-decorated red and golden frame, with 2 dragons wrapped around it on each side. On the reels, find symbols like Dragons, Phoenix, Tiger, Fish, Golden Frog, A, K, Q and J. Launch this beautifully designed slot at Moon Games using a PC or mobile device! Begin your gameplay by selecting your preferred coin value with the + and – buttons on the Coin Value display on Lucky Dragons Slot. A maximum of 10 coins are also provided. When you are ready, simply hit the Spin button. Combine 3 or more similar symbols to be awarded a win. Alternatively, use the Auto Play tab to launch 10, 20, 30, 50, 70 and 100 automatic spins. Also, make the most of other settings like Quick Spin, Turbo Spin or Skip Screens. Amount of Paylines Selection: All 50 paylines remain active during your gameplay. Coin Values: The different coin values available are 0.01, 0.03, 0.05, 0.10, 0.20 and 0.50. The Laughing Buddha style “Free Spins” icon on Lucky Dragons Slot stands for Scatter, appearing only on reels 2, 3 and 4. As for Wild, it is represented by the Gold Coin. It substitutes for any other symbols apart from Scatter to complete winning combos. Three Scatters anywhere on reels 2, 3 and 4 activate 6 free spins and 2x your total bet. The Free Spins round plays on special reels and before each spin, 1 Wild symbol is added on reels 2, 3 and 4. These Wilds stay in place for the whole duration of the feature. Plus, each scatter occurring during free spins triggers 1 extra free spin. 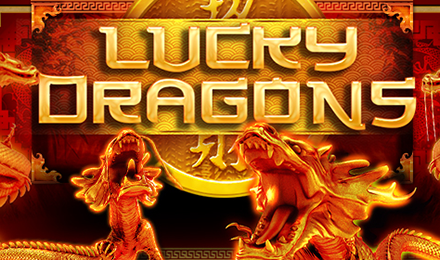 Don’t miss Lucky Dragons Slot at Moon Games, the top online casino. Wish you good luck!